I definitely can agree to this variation of a diet, for those who feel it is convenient to lose weight. Honestly speaking, do you think, it works wonders after some stage of dieting? And are you really able to continue this diet pattern after a week's time? Ok, let me brief you first about the GM diet pattern, for all those who are not aware. This was first started as a 7 days diet program designed for employees of General Motors' company, hence the name GM (General Motors') diet. After this program was designed, people went crazy having seen the desired weight loss results. So, what does this 7 days diet consist? Day 2- All kind of vegetables, can be boiled or salads. Potatoes allowed for breakfast. Day 3 - Any mixture of fruits and vegetables. No bananas and no potatoes. Day 4 - Bananas and milk only. You can include 1 bowl of vegetable soup. Day 5 - feast day- 1 cup rice +beef/ low fat cheese paneer/curds + 4-6 red tomatoes and drink plenty of water to cleanse uric acid level. Day 6 - All vegetables to your heart's content + 1 cup of rice. So what is for Day 8- you wake up from the bed with high curiosity, check the weight and you have lost 2-3kgs. Your body seems lighter compared to the previous weeks. Good start on day 8... Wow! Where is the carb and protein on the first day when you start this diet? 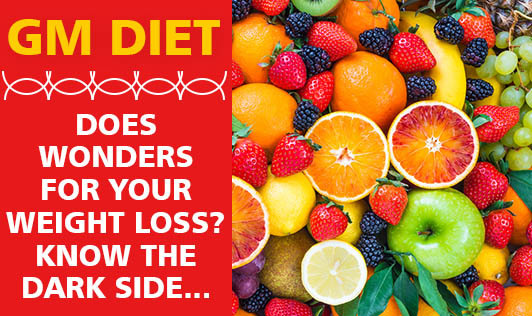 Is it possible to immediately transform your diet to eating only fruits the entire day? Won't you feel fatigued and hungry? How about the skin and hair that you care a lot like a baby? Look at the day 1, day 2 and day 3 diet- what difference is it going to make in terms of calories with just fruits and vegetables consumption. They are after all only sources of fibre, vitamins and minerals. Where has the protein content gone on most of the days? Does your body not require protein to repair tissues and for proper metabolism? As you all know that protein is an important macro nutrient next to carbs, also provides energy and is required for most of the major functions of the body. If you ask me, as a Dietitian, I strongly disagree to this fad Diet. Anyone can lose around 2 kgs by proper balanced diet without compromising on carbohydrates, proteins, fats, vitamins, minerals and fiber, when you consume it through the right quantities of food. If you do not know how much of food to consume for your age, height, weight and activity level, then consult a dietitian who can help you with a customized diet plan.